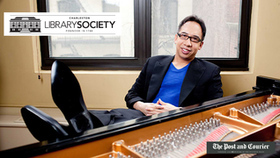 06/17/2015 Kennedy Center / Washington D.C.
Pianist Joel Fan is acclaimed as "soaring" (Los Angeles Times), "fantastic" (Washington Post), and possessing a "probing intellect and vivid imagination" (New York Times). Celebrated for his exuberant virtuosity, and a bold repertoire that embraces piano classics and inspired discoveries of contemporary and world music, Fan re-invents the piano recital by illuminating the rare and unexpected – creating, in the words of the Baltimore Sun's critic Tim Smith, "one of the most satisfying piano performances I've heard." Joel Fan's discography illustrates Fan's highly creative musical persona. Following his work on Leon Kirchner: Revelations – critic Anthony Tommasini of The New York Times proclaimed Fan as an "impressive pianist." Of Fan's recital disc, West of the Sun, the Toronto Star stated, "Fan offers nine stunningly brilliant renditions drawn from a wide range of styles and sources… Capping it all off is an arresting interpretation of Samuel Barber's fearsome 1949 Piano Sonata. Wow." Fan's solo CD World Keys contains five world premiere recording tracks – creating a "deeper, more rewarding experience" (Minnesota Public Radio) – and reaching #3 on Billboard's Classical Chart. As a concerto soloist, Fan has performed over 40 different concertos with orchestras worldwide, including the New York Philharmonic, the Royal Stockholm Philharmonic, the Odessa Philharmonic, Singapore Symphony, and London Sinfonietta, with conductors such as David Zinman, Zubin Mehta, Alan Gilbert, and David Robertson. 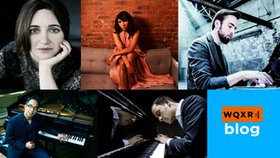 According to the Boston Music-Intelligencer: "We've heard many of the great pianists… Fan belongs in the company of the best." As a recitalist, Joel Fan has found an enthusiastic following on numerous stages ranging from the Ravinia Festival in Chicago, Jordan Hall in Boston, Calgary Celebrity Series, the Metropolitan Museum of Art in NYC, to the National Gallery of Art in Washington D.C. Internationally, Fan has performed recitals on four continents – most recently in tours of China, Cuba and South America. Along with his innovative programming, Fan delivers Mozart with "eloquence and sensitivity" (Boston Globe), and brings "a steely power and feather-light touch to Prokofiev…and redblooded Romantic gestures in Kirchner's sonata" (New York Times). "He deserves special praise for the spontaneity, wit, and emotional urgency he drew from the music" of Bolcom and Carter (Washington Post). 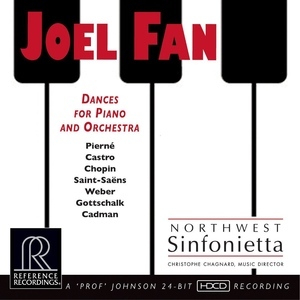 Joel Fan's latest album, Dances for Piano and Orchestra (Reference Recordings), presents another turn in Fan's original approach to repertoire. The disc is a wide-ranging journey focusing on the intersection of music and dance, with rarely heard compositions by Chopin, Saint-Saëns, Pierné, Weber-Liszt, Castro, Gottschalk, and culminating in a world premiere recording of Charles Cadman's Dark Dancers of the Mardi Gras. The disc was released in October 2014 in conjunction with the Northwest Sinfonietta chamber orchestra and music director Christophe Chagnard. 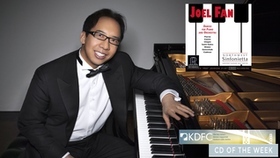 Joel Fan was born in New York City to Taiwanese parents, began early musical studies at the Juilliard School, earned his undergraduate degree from Harvard University, and a Master of Music degree in piano performance from the Peabody Institute of The Johns Hopkins University. He attended the Tanglewood Music Center and the Steans Institute at the Ravinia Festival. Fan is a prize winner of several international competitions, including the Busoni International Piano Competition in Italy. He was also the winner of the Kosciuzko Foundation's Chopin Prize, and named a Presidential Scholar by the National Foundation for Advancement in the Arts. Fan studied with the composer Leon Kirchner and the pianist Leon Fleisher. What came before twerking, Harlem Shake-ing, and popping and locking? The Krakowiak, the Polonaise, and the Tarantelle (which have really cool names, now that we're looking at it). Pianist Joel Fan teaches us all about classical dance music, the composers who made it, and the circumstances from which the dances emerged. Bill Evans Trio: "Waltz for Debby"
Carl Maria von Weber / Liszt: Polonaise Brillante, Op. 72 (S.367) SEE THE KUHA: Houston - Classical Classroom PAGE Audio production by the one, the only - Todd "Pod God" Hulslander with moonwalking from Dacia Clay, and help from editor Mark DiClaudio and intern Nick Dulworth. Pianist Joel Fan is one of the most dynamic and accomplished musicians performing before the public today! 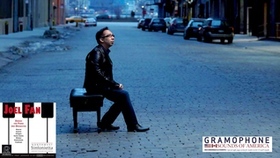 He is consistently acclaimed for his recitals, recordings, and appearances with orchestras throughout the world. His concerts attract a wide range of audiences, as he has eagerly embraced traditional piano literature as well as an eclectic range of repertoire, including new music commissioned especially for him, world music, and his own transcriptions. Joel Fan is recognized for his work with cellist Yo-Yo Ma as a member of the Silk Road Ensemble, with performances at Carnegie Hall and the Kennedy Center, and on the television programs Good Morning America and Late Night with David Letterman. Fan has also collaborated with numerous other ensembles, including the Shanghai Quartet, Imani Winds, and A Far Cry. Mr. Fan's engaging personality, technical assurance, lyricism, and sheer musicality win over audiences wherever he performs. His latest Reference Recordings release - Dances for Piano and Orchestra features the Northwest Sinfonietta and follows two outstanding solo albums 'World Keys' and 'West of the Sun.' 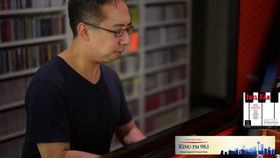 Fan stops by Seattle's KING-FM today to discuss the album and is current tour with KING Morning Man - Brad Eaton for The Classical Notebook. He is in town for a performance tomorrow evening June 20th with Seattle-based community orchestra LUCO which is distinguished by superb musicianship, low ticket prices, friendly atmosphere, central location of concerts, and exciting, innovative programming. JF - Cadman was a prolific composer based in Pittsburgh and LA who helped found the Hollywood Bowl Orchestra. He was also known for introducing elements of ragtime into his music Oark Dancers is a blast to play. As the soloist, you're riding this wave of rhythm, sound and texture created by the orchestra: there's this huge instrumentation andsuch a stirring finish. GP - Gottschalk's Grande Tarantelle Is something of a rarity too - what's the story of the'reconstruction' you've recorded? JF - The piece is originally for solo piano. but Gottschalk would arrange many of his pieces for different ensembles, His orchestration of the Grande Tarante/fe was lost. so the composer and orchestrator Hershy Kay (he who orchestrated Bernstein's On the Town) made this orchestration, It became really well known when George Balanchine used it for his ballet Tarantella. GP - Can you sense the national characteristics In these pieces - the Gallic In Salnt-Sains, the Slavic In the Chopin? JF - Definitely. The Saint-Saens Wedding Cake is so bubbly and elegant. like the fizz in a glass of champagne. The Chopin Krakowiak uses one of the national dances of Poland; you can just picture the dance and all its syncopations in your head when you hear the main theme. There's still that French effervescence in the Pierne but also a sense of visceral excitement too as he ventures through the materials; his work has more 'edge' than the Saint-Saens. Then in the Castro Herrera you have a Mexican composer who writes at the turn of the century as if he were Liszt, with all of the virtuoso flourishes and octaves. It might not have a particular Mexican influence but it reminds you that dancing is universal – you can dance to a waltz in any country. GP - All those runs In Saint-Saens's Valse-caprice sound effortlessly smooth -Is that just practice. practice. practice? JF - There's truly no substitute for practice. Piano technique requires daily care - and then there are all the things you need to do to make music meaningful and emotionally impactful. As musicians you're constantly working on your technique so it can better serve your needs to express what you play. It's like you need to be both the race car driver and the mechanic - making sure that the machine is capable of whatever twists and turns the mind desires. GP - So what race car do you have? Tell us about the Instrument you used here.